Irrigated pasture in Blaine County, Idaho. 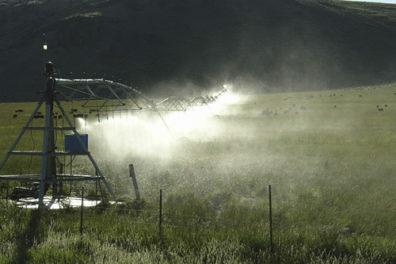 Water demand for irrigation is expected to start earlier in the season as the climate changes. Photo: Mark Goebel under CC BY 2.0. Turns out that understanding how changes in climate are affecting the demand for water for irrigation in the Columbia River Basin is really important for our overall understanding of how water use and management may need to change in the future. Check out this Washington State University newsletter article on a recent study into this topic, led by AgClimate’s sometime-contributor Kirti Rajagopalan. This entry was posted in Climate Modeling, Impacts & Adaptation, Variability, Weather, & Extreme Events on July 22, 2018 by sonia.hall.